At SuprTEK’s Solution Engineering and Delivery (SE&D) business unit in O’Fallon, IL, Team ADEV strives to maintain the collaborative work environment that has resulted in consistent on-time releases and a highly successful operational implementation. One possible key to Team ADEV’s success are its quarterly off-site team building events, or quarterlies to the team. These events have ranged from pizza parties at a craft brew pub to a recent trip to The Edge entertainment center in Belleville. At The Edge, a local fun center with everything from movie theaters to an indoor go-cart track, team members mingled in the arcade and around the bar before squaring off in a two-team game of laser tag and competing in several go-cart races. Yet while these outings are fun, they also help strengthen important work relationships. Spearheaded by Dan Shaffer, SE&D Director of Operations, and organized by Jamie Kelso, Office Manager, the quarterlies vary from competitive games to intellectual exercises. Their purpose is to “give team members the opportunity to unwind and get to know their teammates outside the formal work environment,” explained Mr. Shaffer. The quarterlies also allow team members to discuss issues with peers and superiors in a safe environment. After all, isn’t it easier to talk with a program manager in an entertainment center than in an office environment? The communication bridge also helps avoid any potential conflicts within the team before they start, since knowing each other on a more personal level can ease tension between coworkers. Research into team building clarifies how crucial the quarterlies are for SE&D. First, they reinforce team synergy to help members feel valued, engage in their work more easily, operate efficiently on team assignments, and encourage their subordinates to do the same. Second, the quarterlies help reinforce SE&D’s informal networks, the communication systems that exist outside chains of command. These networks can be invaluable in solving problems when formal networks aren’t available. For example, a developer might seek advice on a coding problem from a coworker with a particular expertise outside his own team because he chatted with her at a quarterly event. Without the peer relationship created through the off-site event, he may not have felt comfortable approaching her with a few questions. Mr. Shaffer and Ms. Kelso choose venues for quarterlies based on recommendations from the team and the level of activity they offer. Occasionally, they turn the decision over to the team through a vote. 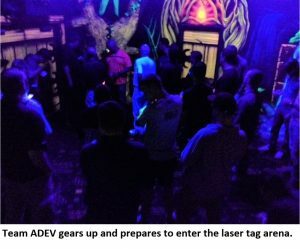 Laser tag at The Edge, for instance, was recommended by a team member and selected for the activities and competition it provided; much more engaging than simply a standard restaurant event. Yet that is not to say leisurely activities are not welcomed. Last December the team went en masse to a local theater to see the latest Star Wars film, and its turnout may make theater visits an annual tradition. Other venues being explored include the Escape Room in St. Louis, which tests critical-thinking skills as participants try to get out of a sealed room within a time limit. Hopefully this, like the previous events, will help Team ADEV continue to provide exceptional solutions with proven results.